In the overheated, hyperbolic rhetoric of response, the API and its bought-and-paid-for Congressional toadies call anything less than carte blanche to Big Oil intolerable obstruction. This is not obstruction, it's a prudent balance—here between development, an extremely sensitive environment, and the traditional subsistence culture of the indigenous Alaskans. The breathless alarmism of Murkowski, Milito and others inveighs against a supposed extremism that is thoroughly fictitious. Current politics on this, as on so many subjects, ignores that American government is designed to produce compromise in matters of policy. Just as parents should not cater to every demand of a 4-year old, so too should our government not cater to every demand of the incessantly whining Fossil lobby. In the same presser, Salazar also commented on the cause of delays to Shell Oil's plans to embark on offshore oil exploration. 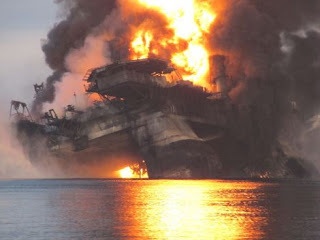 Ironically, it is due neither to the environment nor to government regulation—Shell has simply been unable to finish work to build, test and validate its spill containment ship and systems. Being prepared for the inevitable spills (or worse) is exactly the kind of minimal regulatory oversight required, and which all but the zealots think forms part of a sensible compromise. Meanwhile, one of Congress' leading clowns pursues a fishing expedition pointless even by that body's abyssal standards. U.S. Rep. Doc Hastings, R-Wash., chairman of the House Natural Resources Committee, said the committee is considering whether to subpoena the Interior Department to force it to respond to questions about the need for the moratorium. "While the actions of the Interior Department demonstrate it has chosen to ignore the legitimate oversight responsibilities of the committee, we are dedicated to acquiring information and straight answers about the decisions and actions of the administration that caused lost jobs and economic harm in the gulf," he said in a statement. "It's not a matter of ice, it's a matter of whether Shell has the mechanical capability" to comply with the exploration plan that had been approved. Before the industry and its political shills start castigating compromise as obstruction and complaining about delays, they should look to their own lack of preparedness and their skimpy credibility as the real reasons the adults in the room aren't instantly giving them every last thing they demand.